The Mesa Caledonian Pipe Band is defiantly one of Arizona’s treats. Your ears may not understand what is happening at first, but give it a moment, and you will soon find yourself immersed in the hypnotic sounds with your foot tapping along. 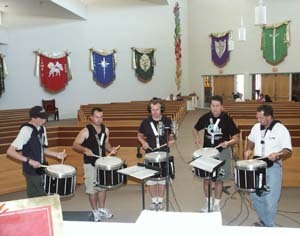 The MCPB is well known throughout the state of Arizona and even as far as Scotland where they receive standing ovations for their concerts at Sterling Castle.